To produce and analyze the recommended performance reports we need to capture and store performance data. This process is normally performed by installing an agent responsible for running UNIX/Linux system tools such as SAR, VMSTAT and IOSTAT to capture information or running (potentially intrusive) kernel commands. As with any data capture whether it is local or remote you’d expect to incur some overhead. Typically agents should incur no more than 1% CPU usage when capturing data, however as mentioned some agents may incur more. In addition when capturing data, can you rely on what it is reporting? Remember this is software and software can contain bugs. But you say ”we have to rely on what the operating system gives us”, and this is true to some extent. From my experience there are several tools to provide this information within the UNIX operating system – some are accurate and some are not. For example: Does your Linux system have the sysstat package installed and is it an accurate and reliable version? Or in Solaris Containers are the Resident Set Size (RSS) values being incorrectly reported due to a double counting of memory pages? An example of this is shown below. This report is an interesting one. 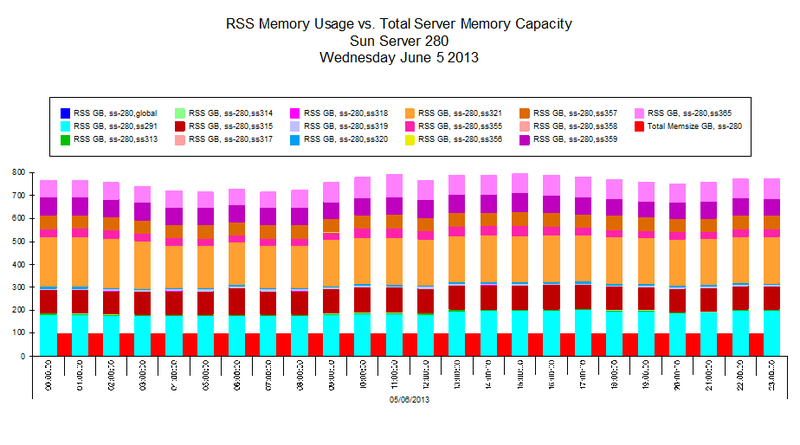 It shows the amount of RSS memory per zone against the Total Memory Capacity of the underlying server (Red). Because RSS values are double counted the sum of RSS for each zone far exceeds the actual Physical Memory Capacity.